1. Preheat the oven to 200˚C, gas mark 6. Toss the carrots with the oil and cumin, season and spread on a foil-lined baking tray. Roast for 40 minutes, until golden. Meanwhile, rub the fish with the chutney; set aside. 2. Squeeze the grated cucumber to get rid of any excess water, then mix in a bowl with the yogurt, lime juice, onion and chilli; season. 3. Remove the carrots from the oven and heat the grill to high. Grill the mackerel for 2 minutes on each side. Crush the carrots with a fork, mix in the coriander and divide between plates. 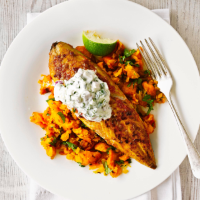 Top with the mackerel, spoon over the yogurt, and serve with lime wedges. To check a chilli’s heat, slice it, touch the cut-side with a fingertip, then touch your lip to see if it burns. Chillies are a good way to add flavour without salt. It may be a myth that carrots help you see in the dark but they do contain high levels of vitamin A, which helps keep your eyes in good shape. Mackerel is high in omega-3 fatty acids, which are important for a healthy heart. It’s also rich in vitamin D, which helps the body to absorb calcium.